In my daily reading of the Bible, I came unsuspectingly upon the story of the woman and her perfume. I say unsuspectingly because I did not foresee the depth which her example would carve out in my soul. You recall the incident. Jesus was in the village of Bethany staying in the home of a man named Simon who had contracted leprosy. That’s a significant side story in and of itself. Anyway, the woman (Mary, according to John 12:3) came to Jesus holding a flask made of alabaster stone, opened it up and respectfully anointed Jesus’ head and feet with very costly ointment (spikenard). At the time Jesus was sitting at the table, and He clearly understood what and why the woman was doing this. She was already mourning His death. But the disciples didn’t get it. They calculated the monetary value of the perfume, and were indignant at such a waste. Their idea was that poor people would have appreciated a donation of food and clothing — a much more useful purpose than perfuming a man, even their Master. “For in pouring this fragrant oil on My body, she did it for My burial. Assuredly, I say to you, wherever this gospel is preached in the whole world, what this woman has done will also be told as a memorial to her” (Matt. 26:12-13). I was never able to buy really expensive perfume for my wife, but I do know that the fragrance of expensive perfume lasts much longer than cheaper varieties. 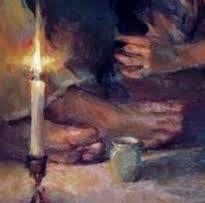 With that in mind, consider that the rich fragrance on Jesus’ head and feet must have lingered throughout the night, into the next horrible day, even into the tomb. As He sat with His disciples in the upper room and celebrated His final meal with them, He filled the room with His fragrance. The Lord’s table carried the aroma of burial. When Jesus led them in a melodic psalm and took them to Gethsemane, the sweat of blood intermingled on His skin with the woman’s ointment. The high priest who judged Him, Pilate who condemned Him, Peter who denied Him, Judas who betrayed Him, the soldiers who pierced Him — all caught the scent of one woman’s worship. The fragrance of the oil lingered on Jesus through his trials and crucifixion and into the tomb. I do not know exactly how to bring the import of all of this over to you. It is a profound and chaotic picture. Jesus and His band of followers having their meal in the home of an untouchable man. The practical ministry need of poverty clashing with the impractical “waste” of a worshipper. And the contrast between Jesus’ awareness of His impending ordeal and the significance of the woman’s kindness — perhaps her sacrificial spirit reminding Him of the sacrifice required of Him — contrasted with the disciple’s ignorance (which we often share) of death, burial and resurrection happening in our very own experience. My daughters and I received an unexpected package one day. Opening it we discovered an array of tiny bottles containing different essential oils, sent us by my niece, Alison. I had not known about these fragrant oils before, nor of their expense and usefulness. I was intrigued that one of them was frankincense. So we began exploring the world of essential oils. This is very poignant to me because the reason Alison so kindly shared these oils with us is because my two daughters, my son, and I were providing hospice care for my wife who lay in the next room of our home with terminal cancer. It was an unexpected treat to be able to apply those healing fragrances on my wife’s wrist or back. We ministered comfort to her. She felt special. Pampered. A few days later Lyn died in our home and went to be with Jesus. We washed her body and again applied fragrance to her skin, and dressed her in clean clothes. We said goodbye. We wept. As you follow Jesus, you answer His call to deny yourself and take up His cross. You surrender to God’s will. You endure times of loss, grief, and waiting — all reminiscent of burial. I wonder, in going through these renditions of Jesus’ life and death, could we bring His fragrance with us? Could we become purveyors of the essence of Jesus — an aroma of life to life, or death to death (2 Cor. 2:14-16)? There is a need for practical frugality. Bless the disciples for their compassion. But deeper still is that whisper of the Father, into our souls, to lavish what is costly on the Son He loves so dearly. I must pause today and reflect on what I may offer Him. I must slow down, sit in silence for awhile, and let the Holy Spirit show me how extravagant worship must linger in the air no matter where Jesus leads me.